Rihanna Gets a Traditional Maori Tribal Tattoo on Her Hand – Using a Mallet & Chisel! 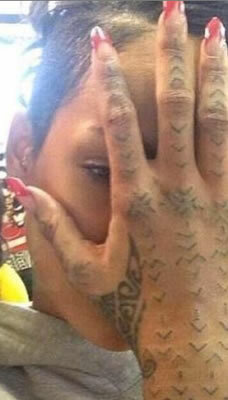 If you thought getting a regular tattoo was painful, check out the new Maori tribal tattoo Rihanna got inked on her hand this week during the New Zealand leg of her Diamonds world tour. In a YouTube video recently uploaded by a local musician, you can see the 25-year-old singer grimacing while having a brand-new tattoo inked on her right hand and arm. But it’s not just any old tat done using a simple needle machine. Rihanna’s tattoo was inked in the traditional Maori Ta Moko fashion, which involves a chisel and mallet. Yes, that’s right, a chisel and mallet. Ta Moko tattoos are done using ink pigment and a chisel and mallet, which helps embed the ink into the skin. Rihanna’s newest Ta Moko tat features an elaborate design of lines and arrow symbols running from the top of her fingers all the way down to the middle of her right forearm. Judging by pictures taken during the tattoo session, which show the pop star with red, swollen hands and weeping knuckles, this latest Rihanna tattoo must have been extremely painful. But as we all know, Rihanna is one tough cookie, and she is willing to endure some temporary pain for the sake of meaningful ink. This isn’t the first time Rihanna has opted for a traditional Ta Moko tat to commemorate her time in New Zealand, although this particular Maori tattoo is far more elaborate. Back in 2008, during the New Zealand leg of her Glow in the Dark world tour, RiRi went under the chisel and mallet for the first time, adding a beautiful tribal dragon claw tattoo to her growing collection of ink. At the time, RiRi and Chris Brown were still an item (this is pre-assault we’re talking), and Breezy got a similar Maori tribal tat inked on his right hand as well. Back in November 2012, RiRi debuted some (fake) tribal tattoos on her fingers for her “Diamonds” music video, but this time they are the real deal!